Washington Garner was born in Morrow County, Ohio in February 1845. Before the Civil War, he attended the public schools in his native state. After the Civil War, he entered an academy; later was a student at Hillsdale College for three years, and graduated from the Ohio Wesleyan University in 1870. Subsequent to graduation, he studied theology in Boston and law in New York. In 1861, he entered the Army as a member of Company D, 65th Ohio Volunteer Infantry and served over three years as a common soldier in the ranks. He was in every campaign, skirmish, and battle with his regiment from the time of its organization to May 1864, when he was badly wounded in the engagement of Resaca, Georgia. From 1889 to 1896, he was a professor in and public instructor for Albion College. He was appointed Secretary of State by Governor Rich, March 20, 1894, to fill the vacancy caused by the removal of John W. Jochim. He was subsequently elected to that position for the term of 1895-7, and re-elected for the term of 1897-9. He also was elected to the 56th, 57th, 58th, 59th, and 60th Congresses of the United States and then re-elected again November 3, 1908. He was Regent of the Grand Council of the Royal Arcanum, and for several years Chaplain of the supreme body. 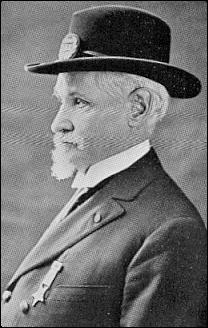 He served as Commander of the Michigan Department of the Grand Army of the Republic (GAR) and, later, as the Commander-in-Chief of the GAR in 1913/1914. Michigan Historical Commission. 1924. Michigan Biographies: Washington Gardner, Lansing.